I must say that Viking knows what they’re doing. Our rooms were on the lower level, below the waterline and very compact, but had what we needed. A lot of forethought had been put into the design of the rooms. There were quite a few US 110-volt plugs as well as the standard European ones. That was great as it allowed us to use all of them since we’d brought adapters along. Guided tours are included with the price of the cruise and there are optional tours available for purchase. Our longship could carry approximately 190 passengers but we weren’t quite full on this trip so they could divide us into relatively small groups which made our tours much easier. Each cabin has radios that will tune to the guide’s transmitter so they don’t have to shout. That’s great because the average age of passengers on this particular ship was probably early-to-mid 60s so I felt like a young ‘un! There’s also usually a “leisurely tour” group for folks with mobility issues so that they don’t slow down one of the other groups. I thought this was great planning on Viking’s part. 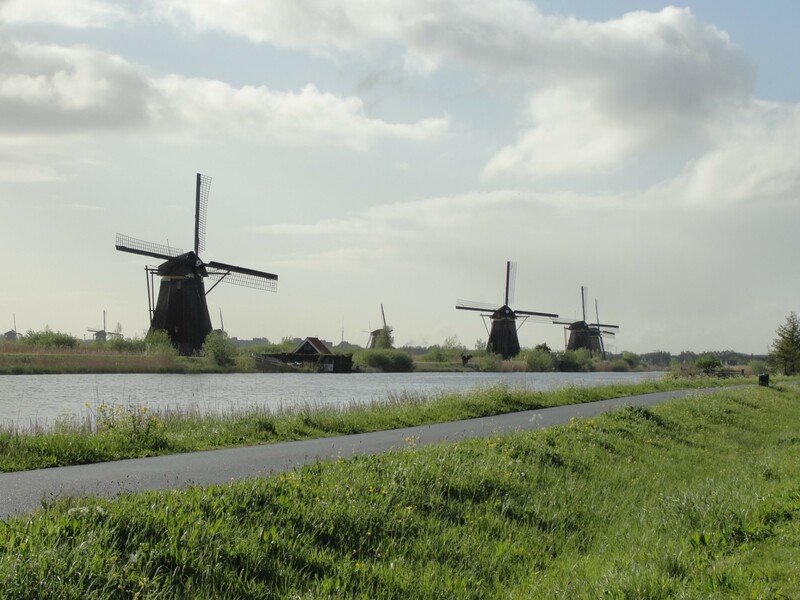 On Friday we were in Kinderdijk, Netherlands, a UNESCO World Heritage Site for the numerous windmills found there. When we arrived, we thought all the windmills looked the same but our guide soon pointed out differences in the ones on our side of the canal vs. the ones opposite. There was one windmill restored for touring and I was struck again at how compact everything was and how difficult that must have been for a family to live in. Saturday we stopped in Cologne and docked right next to the city. We had a walking tour in the morning and then had the afternoon to ourselves. 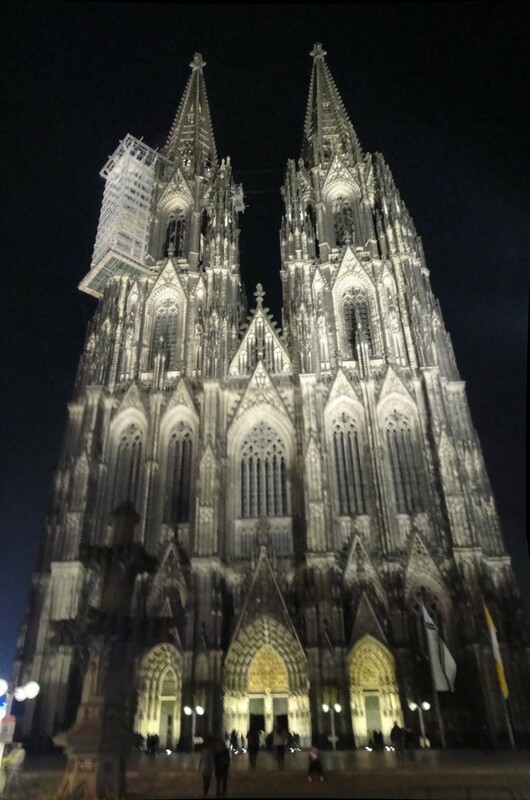 The cathedral there is the most-visited tourist site in Germany and it’s easy to see why. It’s a huge building with gorgeous stained-glass windows and fantastic architecture. Some of us also toured the German-Roman museum and viewed a number of mosaics that had been uncovered on the site (right next to the cathedral). Just about every place we stopped had a magnificent church or cathedral that was several hundred years old. It just reinforced to me how young the US is! It was amazing to think how these huge buildings could have been built 300-500 years ago! Easter Sunday found us at the port in Koblenz where we boarded motor coaches for the drive up to Marksburg Castle. 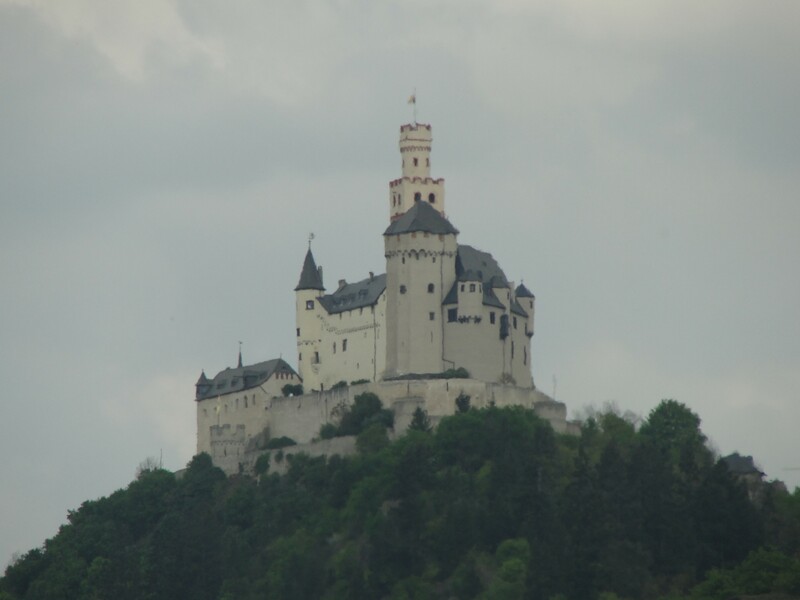 It was never invaded due to its perch high on a river bend and it’s not close enough to a major city to have been damaged during the World Wars so it’s everything you might imagine a castle to be. They’ve done a great job preserving this castle and it has lovely views out over the river. Later that day was one of the highlights, cruising down the Middle Rhine. Fortunately the weather was great and we sat up on the sun deck in lounge chairs beneath an awning and watched a number of castles and towns as we cruised past. The cruise director provided narration as we passed. It made for great photos and was a wonderful change of pace. In the evening, there was an optional excursion to a local restaurant in Rudesheim. We boarded a small tram (made up to look like a train) that wound us through the streets of the town and dropped us off near the restaurant. It’s a quaint town and I wish I’d taken the time available before our outing to walk through it. The dinner was quite good, served by friendly staff. We were serenaded by a live oompah band and after dinner there were several audience participation activities. From a half-dozen people downing shots off the same paddle at the same time to audience members being recruited to play bass drum & cymbals as the band marched through the restaurant, the staff did their utmost to be sure everyone had a good time. All in all it was worth the extra charge for the visit.